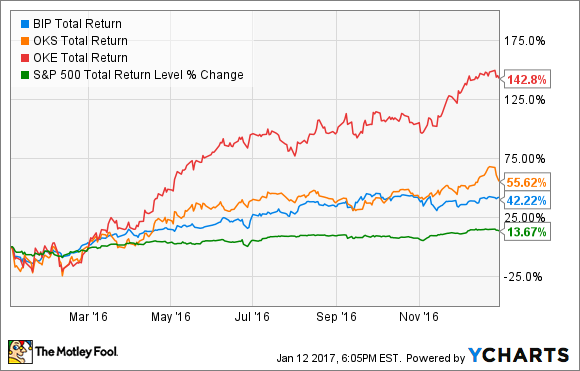 ONEOK, Inc., ONEOK Partners LP, and Brookfield Infrastructure Partners L.P. trounced the market last year. However, there's reason to believe the best may be yet to come for these three. If you were fortunate enough to have bought shares of ONEOK, Inc. (NYSE:OKE), ONEOK Partners LP (NYSE:OKS), and Brookfield Infrastructure Partners L.P. (NYSE:BIP) early in 2016, there's a chance you were looking to cash in on the crazy-high dividend yields you could capture (so long as they didn't cut payouts). Don't let one year of strong price appreciation cause you to miss out on future income growth. Image source: Getty Images. While plenty of people who see those kinds of one-year returns would race to sell and "lock in" those profits, there are some very strong reasons to hold on to these three investments. Let's take a closer look at why, even after such strong gains, it could be a mistake to sell now. 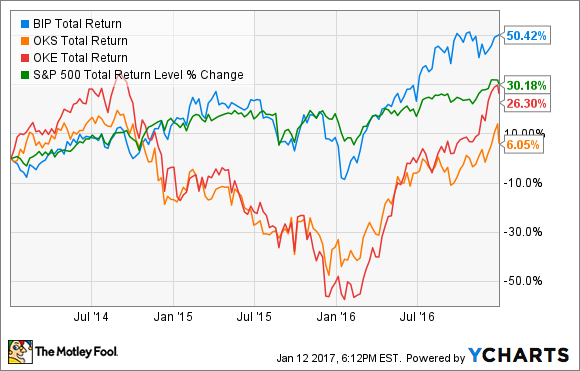 Since the start of 2014, only Brookfield Infrastructure Partners has actually performed better than the S&P 500. ONEOK and ONEOK Partners felt the brunt of low natural gas liquids prices on revenues and profits in its gathering business in 2014 and early 2015, as well as a stock market that had turned negative on nearly every oil and gas stock. Even after ONEOK -- which includes both ONEOK Partners and ONEOK, which is the general partner of ONEOK Partners and a pure-play investment in it -- had taken steps to significantly reduce its commodity price exposure, share prices remained beaten down on a spate of dividend slashing across the midstream sector. In other words, investors who got scared off and sold in late 2015/early 2016 picked the exact bottom to move on, ignoring the fact that management had already addressed the biggest threat to its business earlier in the year, significantly reducing its exposure to commodity prices by half, and is now expecting 85% of its earnings to come from fee-based services. Last year was a rare opportunity to capture income. Don't give that up lightly. Image source: Getty Images. Had those investors remained steadfast and stayed invested in ONEOK or ONEOK Partners through the downturn, they would have regained all of their losses -- and then some -- when the market realized it was putting too much of a discount on ONEOK's assets, based on the real risks. Brookfield Infrastructure is a very different business than the ONEOK group, as it owns a very diverse set of infrastructure assets around the globe, and a number of factors led to its funds from operations -- a proxy for cash profits for MLPs that better represent its results -- growing more slowly than in the prior couple of years, weighing a little on its price. And even though Brookfield Infrastructure's profits didn't grow much in 2016, the market caught on to the idea that its very strong dividend was just too cheap to pass up. A lot has changed for ONEOK and ONEOK Partners over the last year. There was a lot of fear that a dividend cut was imminent. After all, many peers were forced to cut or even suspend payouts to retain cash flows, or risk breaking debt covenants. But in early January, ONEOK was able to secure $1 billion in debt that provided it and ONEOK Partners sufficient liquidity to meet its capital needs "well into" 2017, essentially locking the dividend in place. At the same time, Brookfield Infrastructure was never really at risk of having to cut its distribution, but was dealing with the same market fear of anything that sniffed of energy, pushing its unit price down. The short version is that the market finally realized it was significantly discounting one of the best-run infrastructure investments available. The bigger opportunity for these three could be in holding them for years, and profiting from further dividend growth. Image source: Getty Images. Furthermore, selling now would ignore the tremendous yield investors who bought at the bottom are getting on their initial cost. While there's always a risk that the share price of these investments could decline for various reasons, if you bought them for income, it would be hard to walk away from the 7% or even 10% yield you're getting on your original investment dollars. After all, investors are happy to pay current market prices to get the 4%-plus yields these investments pay on today's dollars. The payouts look to be safe and secure right now, too. ONEOK and ONEOK Partners currently sport coverage ratios of 1.34 times and 1.11 times, while Brookfield Infrastructure only paid out 68% of funds from operations in distributions last quarter. Factoring in the steady and predictable nature of the cash flows their assets generate, these three excellent operators should be able to raise payouts before they are at risk of reducing them. Bottom line: These are still excellent operators with wonderful assets and great management. Consider that before you sell based on lucky timing and a good one-year run.